On a bitter cold day this past February during a trip to Philadelphia for the Tallships America conference Marc Burr and I drove to the far side of Old Philadelphia to the once famous Mt. Moriah Cemetery. We were looking for the final resting spot of Commodore Jessie Duncan Elliott. Elliott, as you know, was the Commandant of the Brig Niagara until Oliver Hazard Perry rowed from the Lawrence and took command from him changing the outcome of the Battle of Lake Erie and America’s future. Elliott would forever spend the rest of his career with the shadow of that day looming over him. For most of us Perry stands tall as an American hero but Elliott has faded into obscurity. We were fortunate to be able to meet with Samuel Ricks from “Friends of Mt Moriah” at the eastern gate of Mt Moriah Cemetery. He led us up a hill on a broken down pathway through thick overgrowth of a once grand parkway to the far corner of this 350 plus acre site. Over 80,00 people, including Betsy Ross, were buried here starting around 1855. Many of Philadelphia’s older churches moved their ancient burial grounds here too. In 2004 the last living commissioner of Mt. Moriah Cemetery Association, Horatio Jones, passed away. A “perpetual care” fund set up in the 1950’s was soon depleted and Mt Moriah went out of business and was abandoned. Today it looks like a gothic nightmare with once imposing mausoleums, elaborate family plots and giant statuary toppled by time, brambles, vandals and trees. Thanks to the Mt. Moriah friends group and a contingent of college students about 35% of the cemetery has been cleared of weeds, bramble and trees. In the back potion of this amazing place Sam Ricks showed us the Navy Asylum cemetery. In the 1800’s Naval Asylums were a mixture of hospital and nursing home and often the place of last refuge for dying sailors. This Naval portion of Mt. Morriah is actually a cemetery within a cemetery where those who died at the Philadelphia Asylum were buried and is “owned” by the US Government. Within the Naval cemetery is small section of War of 1812 Veterans, which is where we found the final resting spot of Jessie Duncan Elliott. Thanks to Mr. Ricks and his friends, this sacred Naval burial ground was pulled back from the brink of complete obscuration. The cemetery now finally has the US Government’s attention. Sadly, Elliott’s grave marker says “unknown” today because the Veteran’s Administration, tasked with oversight of the Navy plot, has been slow to verify those buried there and replace the decaying grave markers. But Sam Ricks and the board of “Friends of Mt Moriah” have continued the research to verify the men buried in this historic plot. Many of the headstones have become hard to read, but with special techniques, effective research and a little sleuthing, the Friends of Mt Moriah have verified the final resting spots for several sailors aboard War of 1812 vessels including the Niagara, Lawrence, Constellation and Constitution. In fact Seaman Thomas Johnson, last survivor of the BonHomme Richard captained by John Paul Jones during the American Revolution, is buried here as well. Mr. Rick’s stated to us “Our first priority on this project is to identify the sailor and marine graves, then go back and research their histories at a later date.” Two stories that he is working on are based on an 1893 Philadelphia Enquirer article about the Asylum. It mentions George Adams and John “Jack” Smith as the two sailors who rowed Perry from the Lawrence to the Niagara during the Battle of Lake Erie. As you can imagine, we couldn’t help but be drawn in by the facts and stories Sam Ricks shared with us. 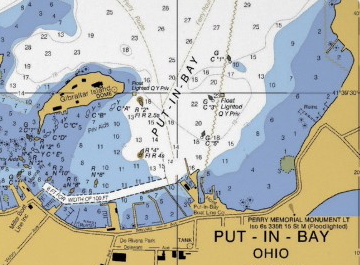 There is much more research to be done on the sailors buried here to find out which others may have served during the Battle of Lake Erie. The pension records for many who served on the Lakes during the War of 1812 are becoming more readily available on the internet, but most still require going to the federal archives for verification. Jessie Elliott, villain or victim? Jessie Elliott was decorated by congress for his actions and promoted to Commandant. Unfortunately for him, Oliver Hazard Perry had been given the same promotion only a month earlier and was given command of the Lake Erie Fleet construction effort. Elliot was then made Perry’s second in command. Upon completion of the two identical brigs, Elliot was given command of the Niagara. On the day of the battle, Perry issued three commands to his fleet’s captains; stay in line, don’t overtake the boats ahead of you, and don’t engage with the enemy until you’re in range. The wind was light as the battle began, but increased and shifted favoring the US fleet. Perry, aboard the Lawrence led the attack, while Elliott on the Niagara brought up the rear. British artillery pummeled the Lawrence while the Niagara remained largely out of range until Perry transferred his command to the Niagara and won the day. Looking back on the outcome of the battle, we need to remember that Perry and Elliot took quite different paths on the way to the 10th of September 1813. Of course we know Oliver Hazard Perry came from a privileged Rhode Island family with a long line of distinguished Naval service. Young Perry’s unconventional approach to command had branded him as brash, yet brave. His family’s political and financial connections assured him of command even after his fateful loss of the USS Revenge and subsequent court martial proceedings. Meanwhile, already fighting the British here on the Great Lakes, Jessie Elliot continued to distinguish himself in a series of key battles and skirmishes. According to Wikipedia, he was transferred to Lake Ontario, and served under Commodore Isaac Chauncey on board the flagship USS Madison and took part in the Battle of York in April of 1813 and the Battle of Fort George later that May. 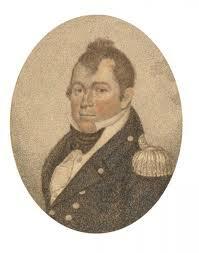 This all led up to his assignment as second in command under Perry in July of 1813. Elliott had earned his way up through the ranks. He had extensive combat experience but was publicly critical of Perry’s decision to use Presque Isle to construct the fleet. Being second in command to OH Perry may have been a very tough pill to swallow for Elliott. So when Perry rowed from the Lawrence to the Niagara and relieved Elliott of his command late in the Battle that September 10th, what ensued was a 30 year controversy over the exact reasons why Elliott hung back during the battle. Was it insubordination, lack of communication, or was Elliott simply following orders? We know Elliott continued to distinguish himself in service well after the Battle of Lake Erie. He was later commended, in writing, by Perry for his efforts during the battle. In 1833 Elliott was appointed Commander of the Boston Navy Yard and then the Mediterranean Fleet in 1835. He had some issues with junior officers in 1838, (he may not have been that popular back in Washington), but in 1843 President John Tyler still thought highly enough of Jessie Elliott to appoint him Commander of the Philadelphia Navy Yard. Elliott died in December of 1845 and was buried in Mount Moriah Cemetery, near the Philadelphia Navy Yard. In 2012 Jessie Duncan Elliott’s unmarked grave was rediscovered. Marc Burr, President of the Perry Group, and funeral director, happened onto the interesting story of Elliot’s final resting spot. According to Samuel Ricks, Graves Registrar Pennsylvania Division Sons of Confederate Veterans, he is in an unremarkable grave, part of a Naval Asylum plot in Pennsylvania. Interestingly, the Naval Asylum Plot is a National Cemetery plot owned and “maintained” by the US Department of Veterans Affairs (VA) inside an abandoned private cemetery, Mount Moriah. The Naval Plot has 5 sections with approximately 1,900 Navy and Marine graves from the Revolutionary War (Continental Navy) through the Korean War. The Naval Asylum Plot is situated in the back of an abandoned cemetery, an “oasis surrounded by jungle”. The VA cuts the grass. There is not even a flagpole with a US Flag flying. Many of the grave markers are illegible. Elliot is buried in the “Officer’s Plot,” Naval 5, Grave 1, (GPS: 39.93687 N, -75.23899 W) at the Naval Asylum Plot inside the Yeadon, Delaware County side of Mount Moriah Cemetery (which spans two counties).